MotoVixen: An elusive female fox that appears alone, in pairs or large groups among motorcyclists, can be viewed mostly on sunny and warm days, but has also been known to brave inclement weather. This fox is attractive, confident, knowledgeable and engaging. She typically can be found among a group of men who are hypnotized by her charm and presence. While the numbers of MotoVixens continue to increase, spotting them can be far and few in between. Capturing one is difficult and ill advised, they can be quite difficult to handle and can cause serious damage if your methods prove to be too aggressive. Approach one with caution and casually, any quick movements or bravado may agitate and cause them to seek solitude. I am told "MotoVixens" is a scandalous name, which always brings a smile to my face. A woman on a motorcycle (I am told by countless men) elicits these images that get them quite heated around the collar, so it begs the question "Why"? Motorcycling is an intimidating and dangerous sport, requires someone with "balls" to overcome those challenges and it takes a very strong personality to back it up. (I see images of Lara Croft: Tomb Raider here). Men love seeing women on bikes, they tell me they wish there were more women that ride, they want more women bikers out there. So then why aren’t there? With the majority of motorcyclists being male and only 11% of motorcyclists out there being women (our numbers do continue to grow every year), we are still struggling to get our needs met as riders. I love riding, I want more women to ride, but the truth is it is hard. Motorcycles are not designed for us, the clothing/gear is not as readily available and as fashionable as we would like (that is changing), women are not as mechanically inclined, may not have a complete understanding of our bikes, the bikes themselves are heavy and the list goes on and on. However, despite all that we want to ride; that is the nature of the human spirit, isn’t it? We know that we can conquer anything and that sense of accomplishment is worth the struggle. It is my mission to be able to provide that sense of community online, have women join and be members, then through the growing membership create a united "voice" that demands attention from the manufacturers. My desire is to have these members come together to help make changes in the motorcycle industry at this pivotal time. We can and will be the ones to pave this road for future women riders. 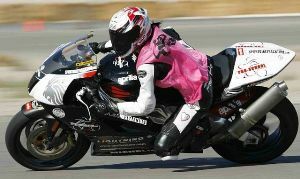 www.MotoVixens.com was launched on October 19, 2012, to empower women riders through education and resources. There are topics of interest specifically targeting women riders including health and beauty, safety, knowledge base (how to’s and articles from experts in their fields), riding tips, rides of interest, products/reviews that women riders will find interesting and resources for online stores that carry various women’s lines (and are willing to answer questions about size and fit of those items). We have a page of "Special Offers" where vendors are giving members a chance to try their services and receive special discounts. A resources page to find links to track schools, instructional schools in your area, organizations you might want to join, etc. We also post events as they are scheduled; many events we post will be "women only" events to help women become knowledgeable about their rides in a comfortable and fun environment. This site was started with only one mission in mind: "To help women riders." The story of my journey is too long to recount here, but I will just say that I thought it would be met with resistance. Instead, to my great surprise, I was welcomed into this "boy’s club" with open arms and a willingness to provide me with the tools I needed to make this dream a reality. They opened doors for me that I would never have been able to open myself, created new avenues for me to experiment with and all the while supported me with their encouragement. I feel fortunate to have crossed paths with some of the most upstanding men in this industry, who have treated me with respect and understanding of my undertaking. They have helped guide my endeavor with their advice and experience to make my dream come true. Three men have been instrumental in MotoVixens: Kevin Davis, GM, Ducati Bellevue; Dave Swezey, GM, RideWest BMW; and Chris Johnson, Owner, WMST. I can’t thank them enough for all they have done, the time they’ve devoted and the advice they have given. I am currently serving as the Ambassador of Women’s Events for Ducati Bellevue and working on workshops, rides and "women only" track days for 2013. The first workshop is scheduled for Wednesday, November 14th from 6-9 p.m.: "Women’s Maintenance Workshop." The workshop will be held at Ducati Bellevue and will include discussions about basic maintenance on your bike, inspection before a ride and a brief discussion about winterizing by Dave Rookaird, Service Manager. Nels Byersdorf of 2 Wheel Dynoworks will then discuss the importance of a dyno. Depending on the size of the workshop there will be 1 – 3 bikes set up for Q & A’s on various topics. The event will start at 7, but come at 6 to socialize a bit before we get started.